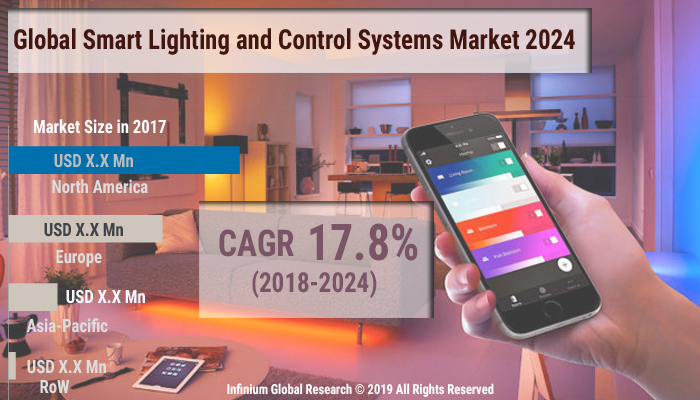 A recent report published by Infinium Global Research on smart lighting and control systems market provides in-depth analysis of segments and sub-segments in the global as well as regional smart lighting and control systems market. The study also highlights the impact of drivers, restraints, and macro indicators on the global and regional smart lighting and control systems market over the short term as well as long term. The report is a comprehensive presentation of trends, forecast and dollar values of global smart lighting and control systems market. According to the report, the global smart lighting and control systems market is projected to grow at a CAGR of 17.8% over the forecast period of 2018-2024. Smart lighting is the intelligent lighting technology that is designed specifically for energy efficiency. Controls system tracts the luminance level of lighting depending on numerous parameters including physical existence and intensity of daylight and many other. There are several benefits offered by smart lightning and controls system, which includes remotely accessing the lighting systems, better energy saving, and cost-effective as compared to the traditional lighting system. Use of smart lighting and controls system adds ambiance, elegance, and convenience to any place. The growing trend of the development of smart cities drives the growth of smart lighting and control system market. Moreover, the need for energy optimized infrastructure in commercial as wells as residential sectors is the major factor escalating the growth of smart lighting and control system market. Moreover, increased demand for intelligent solutions for street lighting systems and an increasing burden of reducing the consumption of electricity are other factors responsible for the growth of the market. The development of infrastructure coupled with growth in penetration of Internet of Things (IoT) is anticipated to increase the demand of global smart lightning and control system market. However, the high cost of the installment is expected to restrain the growth of smart lighting and control system market. Furthermore, initiatives taken by utility companies and government institutions to adopt smart lighting technologies in order to reduce the energy consumption provides significant growth opportunities for the smart lighting and control system market in the near future. The ongoing technological advancements in smart lighting such as developments in the wireless and the internet of things (IoT) technologies is anticipated to create lucrative opportunities in the smart lighting and control market. Among the geographies, the global smart lightning and control system market is bifurcated into North America, Europe, Asia Pacific, and RoW. North America is expected to hold a maximum share in the smart lighting and control system market. The factors such as the high adoption of smart lighting solutions and rising awareness about energy saving are some factors responsible for the growth of the market in the North America region. The Asia Pacific is anticipated to be the fastest growing region in smart lighting and control system market during the forecast period. The major factors such as rapid industrialization along with the necessity for energy optimized infrastructure in commercial as wells as residential sectors fuels the growth of the market in the Asia Pacific region. Moreover, government rules for adopting efficient energy sources is also promoting the growth of smart lighting and control systems market in the Asia Pacific region. Development of various smart infrastructure projects such as airports and ports in countries such as Brazil, Argentina, and Columbia spur the demand for smart lightning and control system market in the Latin America region. The report on global smart lighting and control systems market covers segments such as component, and end-use application. On the basis of component, the sub-markets include light source, and control system. On the basis of end-use application, the sub-markets include commercial, residential, industrial, highways & roadways, public & government buildings, and others. The report provides profiles of the companies in the market such as GENERAL ELECTRIC, Honeywell International Inc, Koninklijke Philips N.V., Lifi Labs, Inc., Lutron Electronics Co., Inc, Acuity Brands Lighting, Inc., Lightwave, Belkin International, Inc., Elgato, and Eaton. The report provides deep insights into the demand forecasts, market trends, and micro and macro indicators. In addition, this report provides insights into the factors that are driving and restraining the growth in this market. Moreover, The IGR-Growth Matrix analysis given in the report brings an insight into the investment areas that existing or new market players can consider. The report provides insights into the market using analytical tools such as Porter's five forces analysis and DRO analysis of smart lighting and control systems market. Moreover, the study highlights current market trends and provides forecast from 2018-2024. We also have highlighted future trends in the market that will affect the demand during the forecast period. Moreover, the competitive analysis given in each regional market brings an insight into the market share of the leading players.